They will ship it from different locations depending on where you are and so for me, they shipped from Hong Kong and it came within 2 weeks! My $30+ glasses complete with case, cloth and clip-on shades. Sweet! 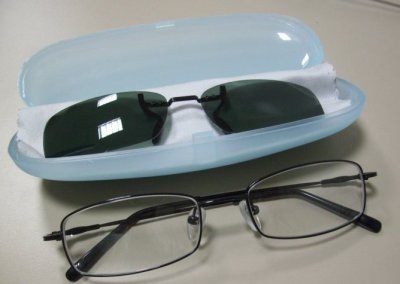 I had the glasses checked with an optician and the glasses’ prescription is indeed correct and my only complaint is that my head is too big so the end pieces are slightly pressing against the sides of my head and I’ve had that with one of my older pairs of glasses. In face these frames have are wider than my old ones, just that the old frames end pieces were designed to curve out and in vs the straight of these from Zenni Optical. So if you have a big head you may want to take note (the pair I got is listed here and has a frame with of 137mm). But all in all I highly recommend Zenni Optical and will definitely shop there in the future!